Along the road that connects Trapani and Alcamo, is where one can find the ruins of Segesta, a City which was founded by the Elimi, a population with non Greek, but continental origins from Anatolici stock. In this particular case, the myth helps to clarify things: after the destruction of Troy, the heroes Enea and Elimo departed for Sicily and arrived in Trapani, founding two new cities: Elima and Egesta from the names Elimo and Egesto, the companions of Enea. Egesta would therefore be Segesta. The story is said to be confirmed by both Tucidide and Plutarco. The history of Segesta is connected to that of the Greek colony of Selinunte, which it was always opposed. In 580 BC, the clash became war and Selinunte came out worse. In 415 BC, Selinunte became a Carthaginian ally and Segesta therefore asked help from Athens, which led to the famous and disastrous shipment of Sicily. This situation was perfect as Selinunte destroyed Segesta without realising that in the meantime, it had become an Carthaginian ally. The direct consequences were a siege and the destruction and massacre of Selinunte by the Carthaginians. 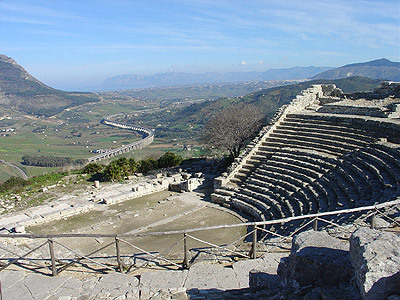 Segesta was then besieged and destroyed by Agatocle, the tyrant of Syracuse (6th Century BC). With the beginning of the clash between the Romans and the Carthaginians, Segesta, a name which has Trojan origins, passed immediately over to Rome, giving it numerous privileges during the Imperial era. The City was destroyed by the Vandali in the 5th Century AD. In Segesta one can admire the largest and most well preserved example of Doric architecture on the island: a temple with 36 columns (5th Century BC) with a complete trabeation and fronton or pediment. In the Mount Barbaro area, one can instead find the Theatre (III Century BC) dug out in the natural rock.